Means of Introduction: Because of their reputation as mosquito-control agents, both G. holbrooki and G. affinis have been stocked routinely and indiscriminately in temperate and tropical areas around the world. In the United States the first known introductions of mosquitofish took place in the early 1900s (Krumholz 1948). In 1905 about 150 G. affinis were introduced into Hawaii from Texas to test their effectiveness in preying on mosquito larvae (Seale 1905), and by 1910 their descendants had been released into parts of Oahu, Hawaii, Maui, Kauai, and Molokai (Van Dine 1907; Stearns 1983). 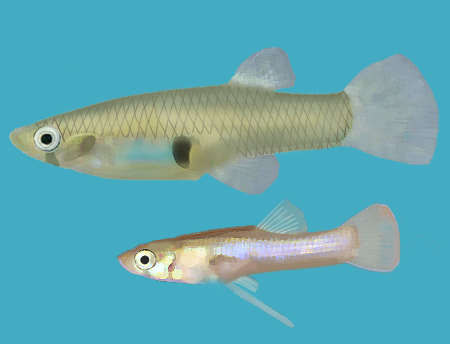 In 1922 mosquitofish from Texas (900 from Austin and 300 from Hearne) were introduced into a lily pond at Sutter's Fort. That lily pond served as a hatchery used to spread G. affinis across California and Nevada during the 1920s and 1930s (Stockwell et al. 1996). Mosquitofish were commonly and widely introduced during the following decades by such organizations as the former U.S. Public Health Service, in large part because they were thought of as an effective and inexpensive means of combating malaria (Krumholz 1948). 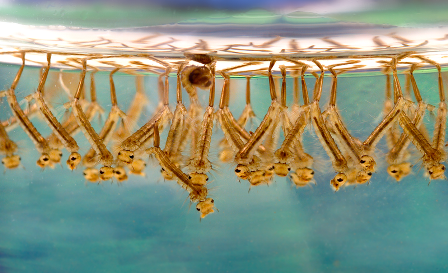 In more recent years, employees of many state and local health departments apparently view the use of mosquitofish to control mosquito larvae as an attractive alternative to the use of insecticides. In some areas range extensions have occurred through natural dispersal far from sites where originally introduced (e.g., Pflieger 1997). Gambusia holbrooki, is a species of freshwater fish, closely related to the western mosquitofish, Gambusia affinis. It is a member of the family Poeciliidae of order Cyprinodontiformes. It is native to the eastern and southern United States, and grows to 3.5 cm in length. G. holbrooki is considered a planktivorous species which consumes algae and detritus to enhance its dietary requirements. Feeding habits seem to change based on maturity and mating season. Gambusia holbrooki is a planktivorous species that will, if need arises, switch food sources to survive. With an increase of competition, this species will switch from a diet rich in plankton, algae, and detritus to one consisting of zooplankton, other invertebrates, the larvae of many species, and plant-associated animals. The main source of competition for G. holbrooki seems to be an increase of its own species and other planktivorous species. The main problem with this is, as mentioned before, it will change its diet; this is common even among the juveniles and both sexes of its own species. The females tend to not specialize on one prey, and consume all evenly, whereas the males and juveniles specialize on one prey type. Males, females, and juveniles all consume detritus at the same rate. Gambusia holbrooki is found in the southeastern United States and has become an invasive species in Australia, where they were released as a method to decrease mosquito populations. This species thrives in shallow water between 31 and 35°C, and seems to be able to acclimate to temperatures above and below this. G. holbrooki has been shown to survive in water with pH and chemical levels known to kill other fish species, and prefers to live in areas where the water flows at a slow pace, is clear and without free-floating plant life, and seeks shelter in rooted plants. Gambusia holbrooki is native to the southeastern United States, and can be found in many of the lakes within that area, which includes lakes east of the Mississippi River. No decrease in this species due to human activities has been noted. G. holbrooki is easily maintained and has never been considered an endangered or threatened species due to its ability to thrive in its native habitat. Due to releases in new areas, G. holbrooki has actually increased its range. It tolerates chemical and temporal changes quite easily, and this might be one reason they have not shown a decrease in population due to environmental changes caused by humans. Eastern mosquito fish live in areas with slow-moving water and free of large, floating plant life. They use rooted plants as shelter. The water temperature in which Gambusia holbrooki thrives is between 31 and 35°C; however, they can tolerate temperatures above and below this. They can tolerate a large change in chemical composition and a wide range of pH levels. As seen on the picture, larvae make dense groups in standing water. A shift in the feeding behavior of those mosquitoes helps explain the rising incidence of West Nile virus in North America. It appears that the darker structure at the top center of the image is one pupa.